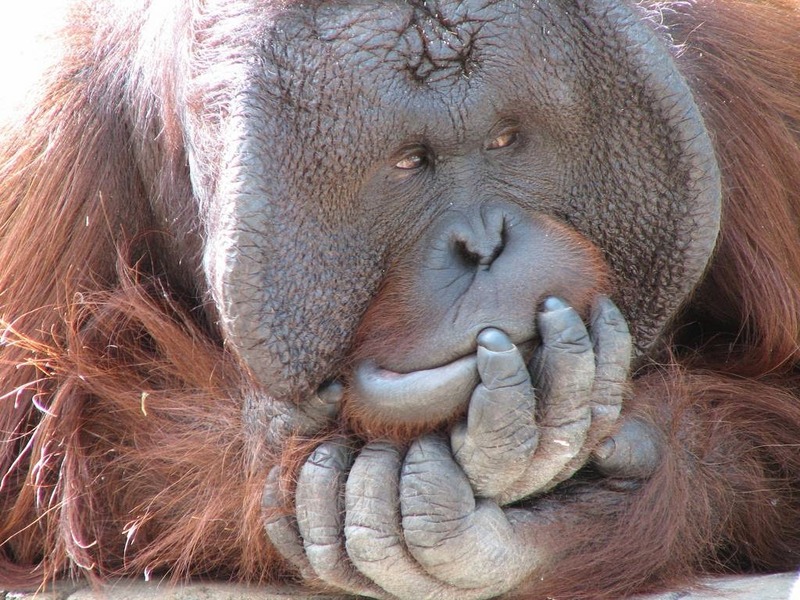 Much is known about orangutan physiology and behavior. Yet there is one thing that is still unsolved – the exact reason why some male orangutans develop a flange while others do not. These large cheek pads certainly have their advantages as we shall see - it’s most certainly about dominance and mating with as many females as possible – so why do they only develop in some males and not others? First things first – the flange is not a physical signal that a male has reached sexual maturity as was once thought – they already have quite a while back. 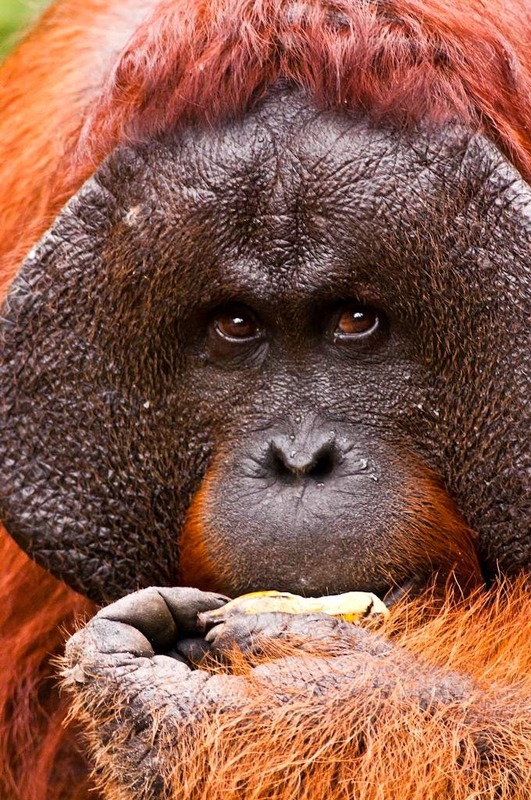 Even though orangutans are among the slowest mammals to reach reproductive age, between 7 and 10 years of age for the male, they are capable of producing offspring at this age. 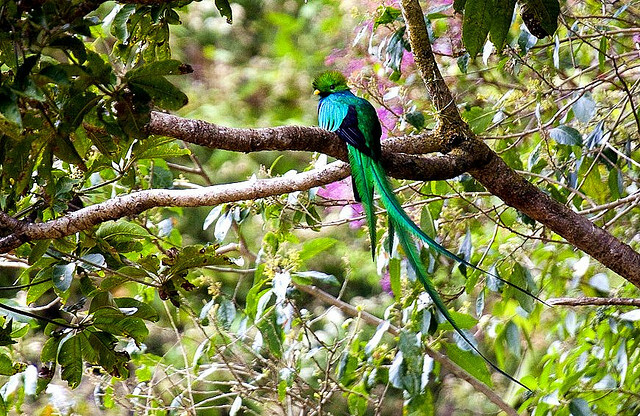 However, it is rare for the male to mate before the age of 15. Females mature at about 5 years of age but like many great apes undergo a period of infertility in their adolescent years which preclude offspring for between 2 and 4 years and will not produce offspring until they too are well in to their teens. Spiders have been studied for centuries. In Middle English the name for spider was coppe and they built coppewebs, a word still retained in the language as cobweb. 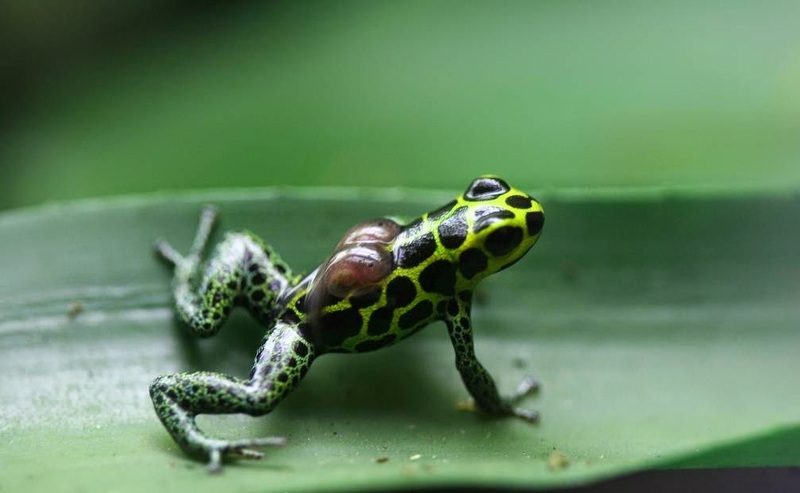 Yet despite our familiarity with these enigmatic air-breathing arthropods, scientists are still discovering new facts about them – and not necessarily about newly discovered species either. 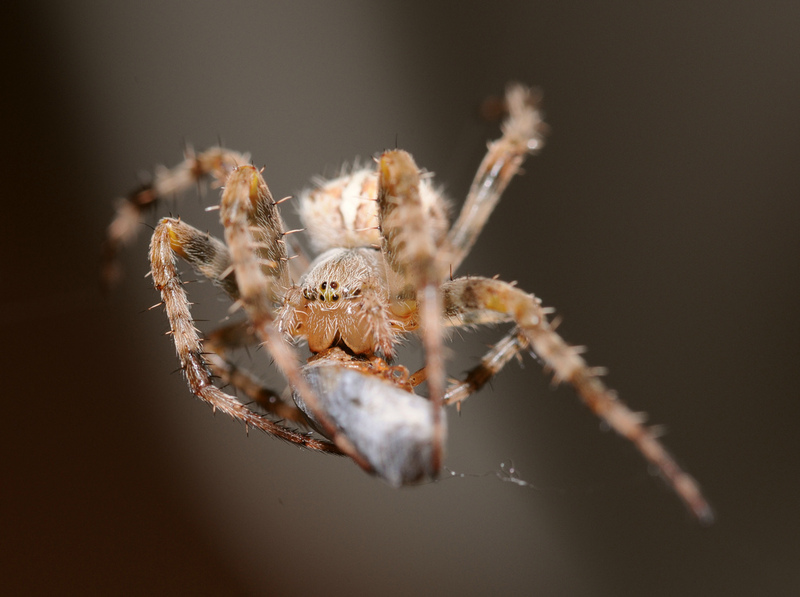 Here are ten amazing recently discovered facts about spiders. 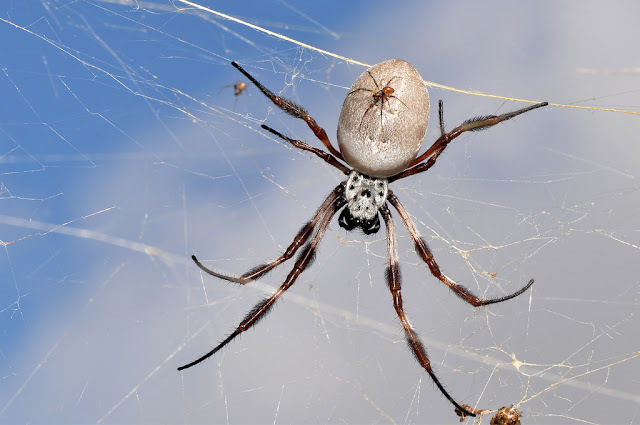 In 2013 students at the University of California, Berkeley, discovered that the web of the garden spider (or common cross spider) is attracted to charged objects. When a charged object is held next to a garden spider web, its threads arc towards each other. Many insects produce a charge when flying – the honeybee, for example, can generate a charge of up to 200 volts as it moves its wings. So, if one gets close to a web, the threads arc, effectively sucking the hapless creature in to the web. Scotland is a stronghold for the red squirrel: its numbers in the UK were decimated by the introduction, around a century ago, of grey squirrels from North America. Larger and more aggressive, the Americans soon took over most of the red squirrels’ habitat. Yet in some parts of Scotland there are no squirrels at all – a result of land clearance – squirrels do not travel well when there is no tree cover. So, Trees for Life have started the process of populating ten sites in the Scottish highlands with red squirrels using members of existing populations and moving them to their new home. 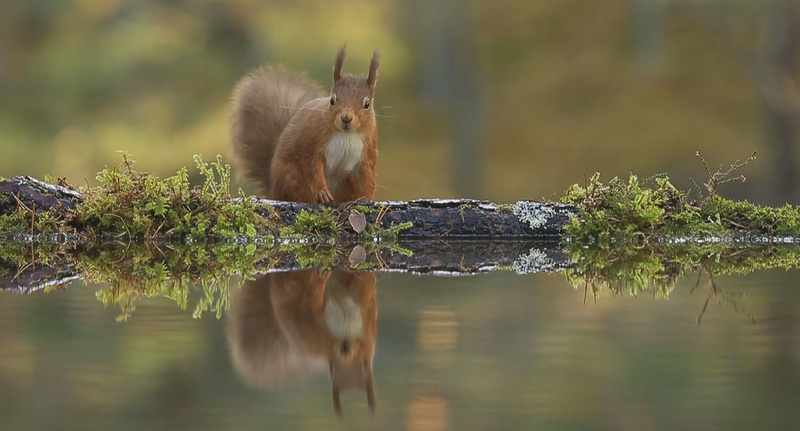 This fascinating short film by the Wild Media Foundation follows the journey of four red squirrels as they become pioneers for their species in a new habitat. 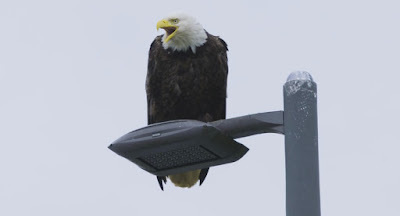 It may be the national bird, but many Americans go through their entire lives without seeing one. Not so the residents of Unalaska (in, unsurprisingly enough, Alaska). It is one of the biggest fishing ports in the world and when the fishing boats return, bald eagles are waiting for them – in their droves. Great Big Story takes a look at this fascinating bird which is about as opportunistic a feeder as you can get (that means it’s not desperately fussy!). Cephalotes is a broad genus of ants. They are heavily armoured – it makes you wonder just how formidalble they would look if we were the same size. The amazing thing about many of them is the head – used to plug a gap as it were. 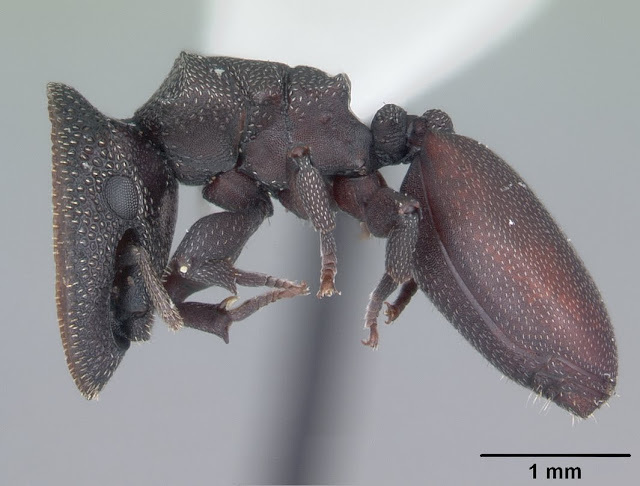 Above is an ant of the species Cephalotes varians. The ants live in trees in the forest areas of the new world tropics and the subtropics. 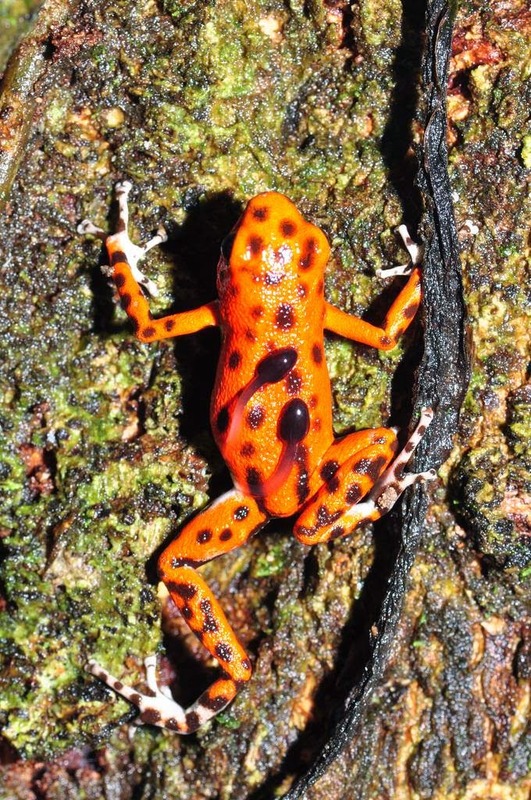 Some Cephalotes species can even glide back to the tree if they are knocked from it. Most of them are what is known as polymorphic which means that they have various castes that have a specific use and purpose in the colony. 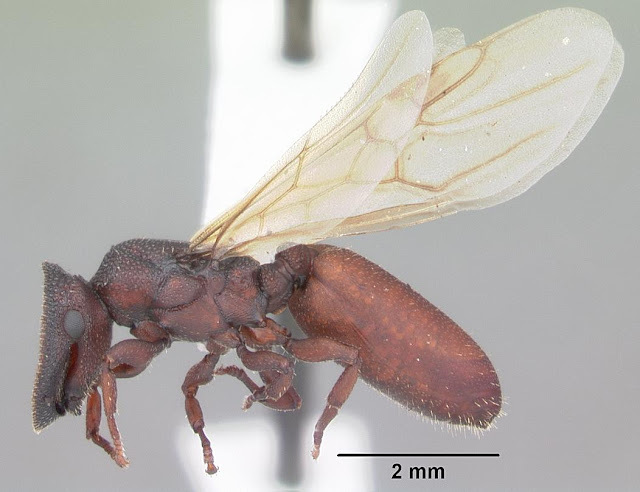 Above is another example of Cephalotes varians, also known as the turtle ant. We are afraid we cannot tell you for sure why this one has wings - perhaps when a new colony is being formed? There is nothing better than having a good feed when you are hungry - and when you are a baby pygmy goat you tend to be hungry most of the time! 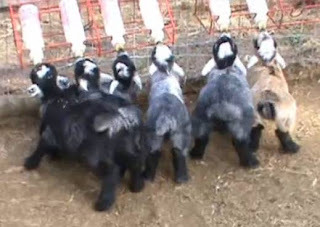 These six little goats not so gruff indicate their pleasure with a furious wagging of their tales. What is more the pygmy goat is a friendly little beast even when it is not being fed - and a whole heap of fun in to the bargain. Although they may not immediately spring to mind as the perfect suburban pet as long as you have a mid-sized garden at the back of your house they can make engaging pets. Unlike their cousin the standard goat, pygmies are kept simply for the fun of having them around and of course, the goat gets to have a lot of fun at the same time. They are not what is known as a utility animal in as much as they are never kept for their milk. Really, how much milk are you going to get out of one of these mini goats anyway? As for their meat – no way! This is the goat that is kept purely as a pet. The manta ray has fascinated people for centuries. Yet we usually encounter them as they glide magnificently through the oceans. A luck few will get to see them break the surface and leap in to the air. 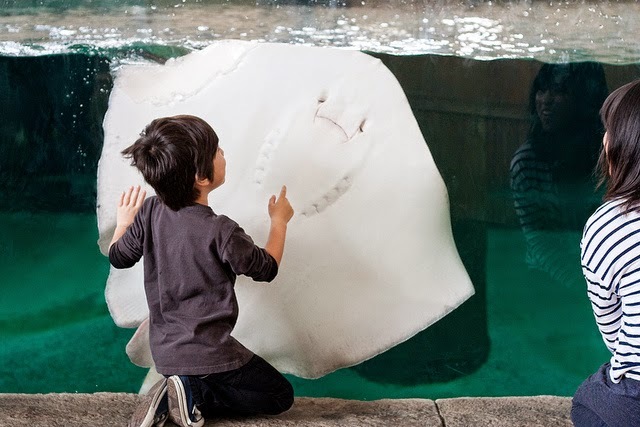 For many people, however, the only time they will encounter a manta ray is in an aquarium. It is then that the inquisitive rays will show their faces, as it were. The result is quite extraordinary. 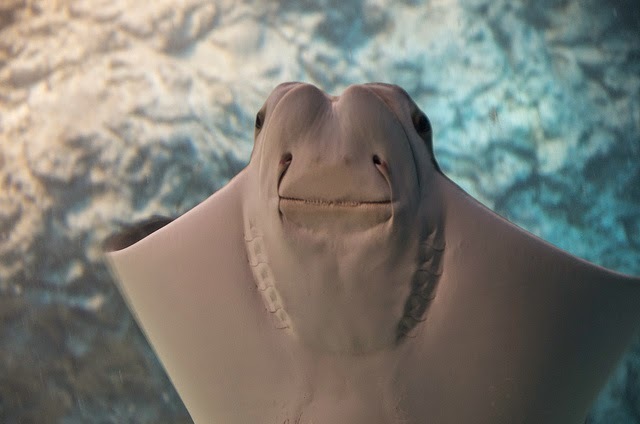 However, the physiology of the manta ray (rays in general in fact) has led to some confusion – often people think that they are being ‘eye-balled’ by a ray. The youngster in the picture above quite possibly believes that the ray in the pool is exchanging glances with him. Yet if you look at the first picture again you will see that the eyes are above these openings. These things that look like eyes are in fact something else altogether.